Now this billboard is absolutely amazing, and I mean that in the worst possible way. Newsflash: If your life is so comfortable and so suburban middle-class that the greatest catastrophe you can ever face is having a daughter who wears a collar and has her tongue pierced, you should fall down to your knees and give thanks that things are going so well for you. Folks, this is not a crisis. It's normal adolescence. Remember when you pierced your ear or let your hair grow down to your collar, and your parents had such a heart attack that you almost got shipped off to military school in North Dakota? You turned out okay, didn't you? 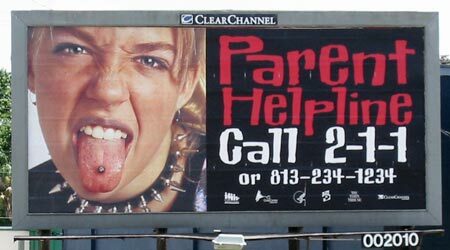 Given the number of families in this country who face crises involving armed drug dealers or worse, this billboard is just stupid.